My visits to national parks have been few and far between—my first trip to the Grand Canyon was just a few months ago!—so it was no surprise that I’d never heard of “firefall,” at Yosemite National Park, before today. For about one week each February, the sunset over Horsetail Fall creates an amazing illusion: It makes it seem like the water is on fire. 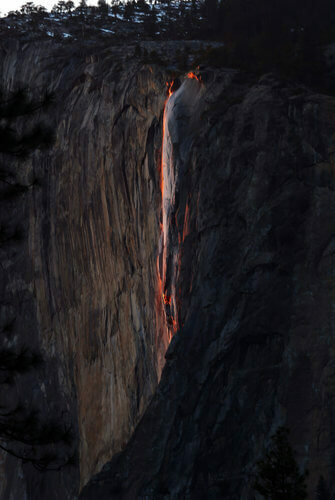 And each year, hundreds of photogs trek to the park for a chance to capture this “firefall.” Some of the images out there are astounding—it really looks like red-hot lava, and not mere water, is flowing over the cliff!